The fact that Robert Griffin III and Andrew Luck would dominate football card sales this season was a foregone conclusion. While both are bringing in strong numbers with their first fully licensed NFL cards in 2012 Bowman Football, it's the number two pick who's commanding the higher prices. 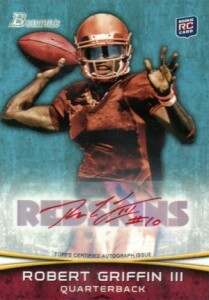 Get full 2012 Bowman Football details and a complete checklist. Robert Griffin III, the 2011 Heisman Trophy winner and second overall pick in the 2012 NFL Draft, had the top 2012 Bowman Football sale on eBay during the set's first week of release. His Rookie Autograph Red Ink parallel went for an even $1,000. The card, which is limited to 15 copies, was the only one from the set to reach four figures during the small time frame. 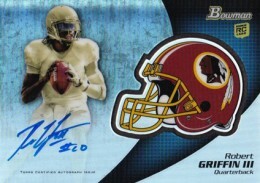 A dual autograph featuring both RG3 and Luck held the second and third slots. Numbered to 25, one closed at $650 while the other finished at $600. 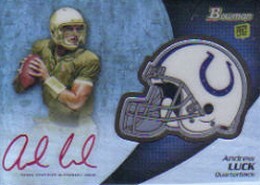 The top sale featuring just Andrew Luck was a 2012 Bowman Football Chrome Refractor Rookie Red Ink Autograph. Limited to 15 copies, the card sold for $540. 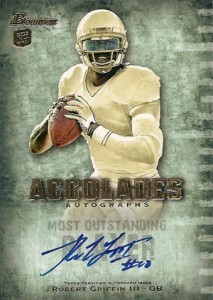 This tied with another Griffin III card, an Accolades Autograph, which has no stated print run. RG3's regular Chrome Refractor Rookie Autographs dominated the bottom part of the list, accounting for four of the final five slots. Almost all have closed above $300. Most of Luck's autographs have been hovering in the $250 range. The top card not to feature either of the first two picks was a Justin Blackmon Rookie Autograph Red Ink parallel, which sold for $265. Figures based on realized prices of completed eBay sales through June 6, 2012.